Very recently, I have been enjoying decoupage. I find it a very simple and effective way of making things look pretty and it is very therapeutic. 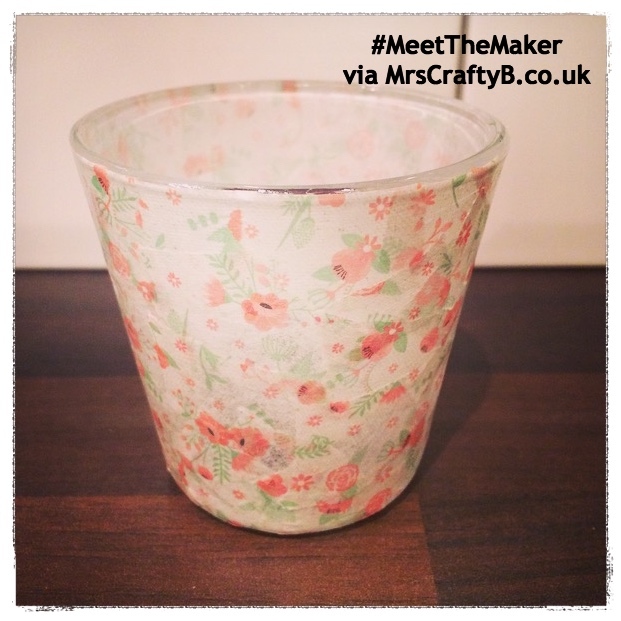 Zoe of ZoFlo also enjoys the craft and is sharing something she made recently on #MeetTheMaker this week. Thanks for joining us Zoe. How would you normally catch up with a friend? Whenever I catch up with friends, it usually involves food! I love going for lunch/dinner or even a nice cupper and a slice of cake. Gosh that sounds perfect. A cuppa and cake is spot on! Tell us a bit about you. I am a craft blogger who has a passion for sewing. I enjoy learning new things so do love to dabble with lots of other crafts too. I started my blog in my final year of University to help keep me sane (or to avoid doing University assignments…) and 3 years on I am still blogging away. I have recently made myself a floral decoupage candle holder which I am sharing with you today. I have really gotten in to decoupage recently as it is such a simple craft. I did this one whilst cosied up on the sofa watching TV! I totally agree. I have really enjoyed the simplicity of decoupage and the results you can achieve. Where did you learn to decoupage? I haven't been brave enough to try something like that yet. What inspires and motivates you? I love looking at what other craft bloggers do. They inspire me the most. It is such a lovely community to be a part of as well and we often share tips and ideas on Twitter. If I am ever struggling for ideas or need motivation, I will browse Pinterest. I have lots of project ideas pinned to many different boards on there, I just wish I had the time to actually do them all! I hear you ha ha. Not enough time for the list! I also agree that the craft blogging community is a fab source of inspiration. Where do you like to craft? When it’s a little too cold to go upstairs to my little craft room, I like to craft at the dining table. I also like to be able to chat to my other half or watch TV whilst I craft. I absolutely love sewing. It all started at a young age for me, as I use to do little sewing projects with my Gran. I then went on to study Textiles for my GCSEs and A Levels. I only really used to do home furnishings as I was too scared to make my own clothes, but recently I have been brave and have started to experiment with the odd item of clothing. I have plans to make myself a dress to wear on my holiday which scares me a lot, but I enjoy the challenge and hope it will help me to improve my skills. I would love to see your dress once you are done. Do you have any crafting tips? I often take part in #CraftBlogClub which is a group discussion on Twitter every Tuesday evening at 7pm. We exchange ideas, tips & any project updates we may have. It is nice to have a regular place to chat to likeminded people.#CraftBlogClub also run various challenges throughout the year which are always good fun. I have previously taken part in a Spring Clean Challenge, Secret Santa and at the moment we are doing a “Craft Resolutions” Challenge. Do you have any big pans for the next 12 months? I love May Martin from the Sewing Bee. She seems like such a lovely lady! I have a small footstool I upcycled that I keep in my lounge, hidden away so no one can ruin it! I painted the legs cream and covered it with beautiful elephant patterned fabric. Paris! I went there last year for a long weekend with my boyfriend. It was our first holiday today so a very special place for us both. Summer BBQs, winter walks & my boyfriend! Thanks so much for featuring on #MeetTheMaker Zoe. Keep us posted on your craft selling and sewing ventures!